My name is Mirella van Staveren. I had written a longer version for the ‘about Mirella’ page on my website and my webdesigner spontaneously created a blog out of it. I like to go with the flow, but let me rewrite a little for the occasion. If you don’t want to read the whole blog, then you can find at the bottom of the page my timeline. You can also meet me in short on my website in the About Mirella section. ‘Menstruation, the cycle and also sensuality are in general difficult topics to talk about’. You might wonder why a blog about Mirella? Well, with the workshops and the work I do around the menstrual cycle and sensuality, some women feel vulnerable and sensitive and I want to meet you, at least, by telling you about my own life journey. My name is Mirella van Staveren, born and raised in IJmuiden, Netherlands. After living abroad for 15 years, I moved back to Holland in February 2018. I now live in Culemborg ( half an hour underneath Utrecht, in the center of Holland) with my Husband Harry and daughter Leela (2009). I was diagnosed with ME/Chronic fatigue syndrome when I was 27 years old. Four years after being diagnosed I started with a year program in centre Venwoude, Holland, that brought about deep emotional and spiritual transformation. During a training I received a big ‘revelation’. A voice coming from within told me to move to Israel. I was shocked, and had no intention, nor desire to move to Israel. My then spiritual teacher Ted Wilson always said that “if life is knocking on your door, you better open to see what’s there”. So, I decided to take a chance. I thought my life there would be about studying Jewish spirituality and working for the Peace process. It was the only way to make sense of this revelation. But I couldn’t enter any of the Peace organisations and found myself very disappointed with Jewish spirituality. Instead I set up a small Centre: “Libi” – Centre for Awareness, Meditation and Inspiration (Libi means in Hebrew “My Heart”). It was an incredibly beautiful time, and I met lots of beautiful people. I met my husband Harry and the next chapter of the journey began: a wife and a mother. A year after meeting Harry and I were officially together. We had both said that we didn’t want any children as we were dedicated to our Spiritual path. Then one afternoon everything changed. I was diagnosed with Endometrioses, a myoma (a benign tumour composed partly of muscle tissue) was found around my cervix and was operated within days. My gynaecologist casually told me that at 38 years old I should really think about what I wanted to do with my life – which meant “did I want to have children?”. To my surprise and shock, Harry, suddenly suggested that we would stop contraception and try to conceive. We talked for half an hour, but it did not matter how long or what was said. Her Soul’s Presence was so clear that it was already decided. We surrendered. At three months pregnant, we moved to Wales and we got married. I never wanted to be a mother, I didn’t think I had the skill, nor the energy to do it therefor I realized had some inner work to do. I started studying about giving birth in a natural way and about natural parenting way beyond conventional thinking. Thanks to the work of Ina May Gaskin, her book “Spiritual Midwifery”, Lee Lozowick’s book “Conscious Parenting” and Jean Liedloff’s book “The Continuum Concept” I was ready to deliver and become a mother. Leela was born beautifully in a big round warm water bath in hospital, and came home sleeping with us in our big bed at home that same night. Three months after Leela’s birth we left the community and moved back to Holland but back in our homeland and living in a little wooden hut, very depressed, our relationship got worse. We had a beautiful little girl and I was doing “everything” I thought I should be doing to make our family work. But I was very controlling and needy of Harry and his time. Tensions grew. I was in despair and this sparked the next chapter in my journey began: the exploration of the feminine. Meeting spiritual teacher Lee Lozowick, I put my despair on the table and he suggested the work and the book of Laura Doyle, “The Surrendered Wife” (I loved the title but many women don’t, and consequently she changed the name to The Empowered Wife). This book transformed our relationship; within two weeks we were back on track and I was immediately so much happier, relaxed and empowered. After moving about twenty-two times since leaving Israel, our family settled at Suryalila Retreat Centre, Spain, where we have spent the last 7 years. I set up the Shakti boutique, a shop in the retreat center, selling yoga clothes and items, gifts from all over the world, spiritual artifacts and much more. The more I got into femininity, the more female products entered the shop. I loved inspiring and empowering women and I had many fun and hilarious encounters talking about yoni eggs, organic cloth washable menstrual pads and more. Becoming a wife and mother had taken its toll on me and I needed more guidance. So I signed up for a year coaching program with one of Laura Doyles coaches in order to deepen my surrendering skills and learn to take better care of myself. It was fantastic but I also needed something more and that is when I found The School of Womanly Arts, by ‘Mama Gena’. I dived in; read the book, participated in the Online Virtual Pleasure Bootcamp program, and beyond my own believe I travelled to New York for 4 weekends in half a year to attent her Mastery Program. It changed my life beyond belief. I started loving myself, my overweight, body and I practised flirting with myself and others. I allowed myself to eat whatever I wanted which made me eat healthier, as well as allow myself to indulge in the goodies I love so much. Here I unleashed my sensuality and love for the senses and discovered it to be one of the best self-care practices. I started to ‘fall in love’ with the feminine, with women and to see their inner radiance. Then I came across Menstrual Cycle Awareness (MCA), the work of Alexandra Pope and Sjanie Hugo Wurlitzer. Through different methods I started learning about my cycle and am still in awe of its depth and power. I attended a workshop on Menopause with Alexandra Pope and continued with a training on the “Women’s Quest Apprenticeship” where I deepened my understanding through my own experience and theory of the menstrual cycle. I passionately believe it’s one of the most important things to share with women. It’s a birth right to know your body, emotions, mind, spirit and how they are ever changing hormonally from Menarche till Menopause. More about the way it all started and my finding on the blog about my monthly menstrual ritual with my daughter. After 7 years of living and working and home-schooling Leela in the Suryalila yoga retreat centre in Spain, it was time for us to come back to Holland. We moved in February 2018 and Leela is going to a wonderful school and I feel excited to share my experience and knowledge with women in Holland. 2002 – 2003 Venwoude, year intensive living and working in a center for emotional and spiritual development. Here I met my first Spiritual teacher Ted Wilson. 2004: Moved to Jerusalem, where between 2006 and 2009 I opened Libi, Center for Awareness, Meditation and Inspiration. Libi means in Hebrew My Heart. 2009: Married to Harry and giving birth to Leela. 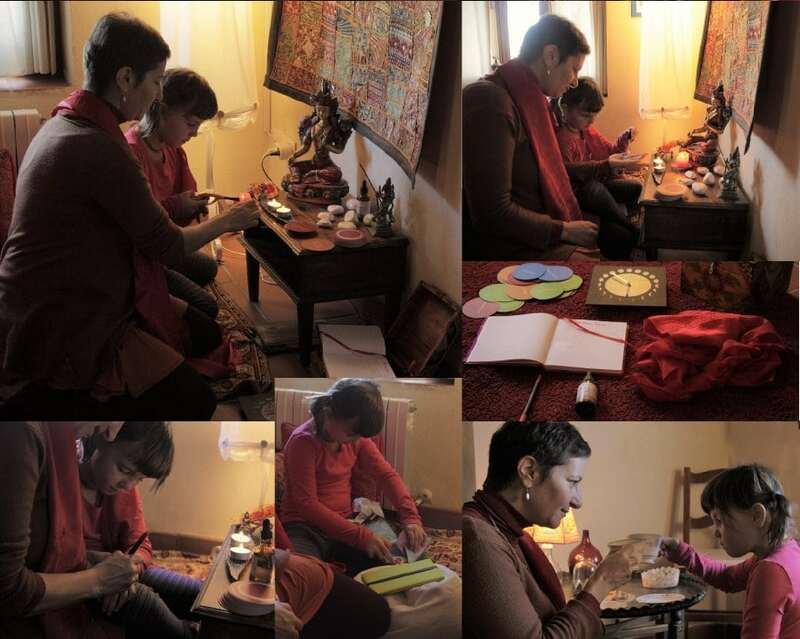 2012-2018: Setting up and managing Shakti Boutique, Suryalila yoga retreat center Spain. What a long story! If you have made it all the way here thank you! Hats off! If you feel like meeting me further you can contact me here or leave a comment below. I don’t evеn know how I ended up here, but I thought this post was gooԀ. to а famous blogger if you aren’t already 😉 Cheers! I only get back to you now, as my website had to be transferred to another url.